Plantronicsis anelectronicscompany which producing audio communications equipment for Contact centers, enterprise and consumers. Plantronics products supportunified communications, mobile, gaming and musicHardwareworld wide. Plantronics manufactures the industry''''s most compatible corded and wireless headsets products for unified communications. Plantronics is Widely recognized for their sound quality, reliability and comfort, Plantronics'''' audio solutions help companies extend the benefits of IP communications throughout the extended enterprise, fostering better business communication and efficiency regardless of where professionals are working. Plantronics has partnerships with all the leading Unified Communications providers for enterprise, BPOs and Call Centers, and ensurecompatibilityand interoperability with all plantronics products. If you need anyassistancerelated with Plantronics Products pleasecontact USto get the support from an Experts Today. 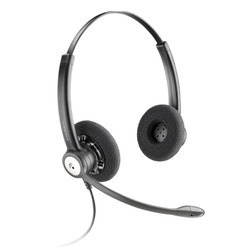 The Avaya L119 Headset is a monaural entry-level headsettargeted for the UC worker. Fully wired with the end to ahook-switch, the Avaya L119 Headset offers an excellententry level solution for the modern executive on Avaya’sDesktop IP Phones. The headset is wrapped neatly inred stitching leather headband and ear cushions, whichreflect the distinct Avaya brand. It also has in-built support for H323 deployments. 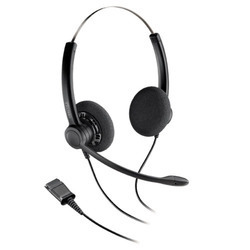 The Avaya L139 Headset is a monaural midrangeheadset targeted for the Call Centeror UC worker. It connects to the end of aQuick Connect and provides the connectivityoptions to cables with hook-switch, USB and3.5mm. This headset has a brushed aluminumlook with the cable ending with a Quick Connect. The headset can bewrapped neatly in an optional leather band and ear cushions, reflectingthe distinct Avaya brand. 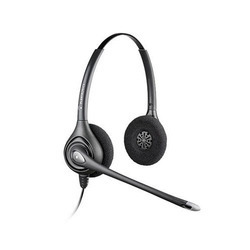 he Avaya L149 Headset is a binaural midrangeheadset targeted for the Call Centeror UC worker. It has a brushed aluminumlook, connects to the end of a QuickConnect and provides the connectivityoptions to cables with hook-switch, USB and 3.5mm. 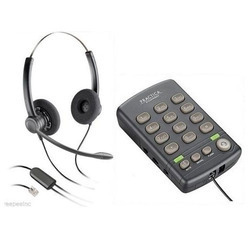 The headset can bewrapped neatly in an optional leather band and ear cushions, reflectingthe distinct Avaya brand. We are an acclaimed entity, engaged in offering a wide range of Plantronics Practica T110 Headset. Being a quality-oriented organization, we assure our clients that these systems are the best in quality. Our vendors' skilled professionals only utilize fine quality basic material, while manufacturing this headset. Moreover, our offered range can be availed in a wide range of sizes, designs and shapes, as per the requirements of our esteemed clients. We have marked a distinct and dynamic position in the market by providing a high quality array of Call Center USB Noise Cancellation Headset. It is ideal for call center agent who requires great audio performance and reliability. Our offered range is availed in a variety of sizes, designs and other such specifications to choose from. This is famous in major domestic call centers for its featuring wide band technology and a noise-cancellation mircophone, headset delivers strong value and performance to cost-conscious call centers and BPO's. The offered range is precisely designed at our vendors' highly advanced manufacturing unit following industry defined guidelines. The offered range can also be availed from us at the industry leading prices. Ideal combination of value and performance. 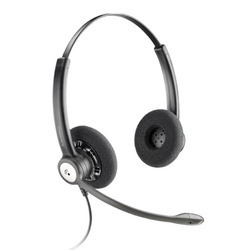 Headsets of choice for cost – conscious contact centers. We take pleasure to introduce ourselves as one of the leading organizations, engaged in offering a comprehensive range of Plantronics Practica SP12 Headsets. Featuring a superlative design, the Practica delivers call clarity through noise-cancellation technology. Adjustable components and plug-and-play simplicity ensure comfort as well as ease of setup and maintenance. These headsets are manufactured using excellent quality basic material and latest technology by our vendors' skilled professionals. In order to ensure quality, these headsets are stringently tested on various parameters by our vendors' experts. Apart from this, remarkable quality and precise design increase the demand of our offered range in the market. With the help of our team of adroit professionals, we are indulged in offering a wide assortment of Plantronics Hw121n Entera Headsets. Ideal for contact center agents who requires great audio performance and reliability, offered headsets are famous in major domestic call centers for its featuring wideband technology and a noise-cancelling microphone. Our offered range is designed from using superior quality basic material and advanced technology by our vendors' experts. While designing the offered range, our vendors' lay special emphasis on the overall quality and durability. Additionally, our vendors' quality controllers keep an eye on the entire range to eliminate any possibility of flaw. Plantronics HW261N SupraPlus Binaural two ear side communciation Headset offers supperior audio quality and offeres comfort to the Contact Center, Call Center and BPO professionals..
All the Call Center, Contact Center and office executives rely on Plantronics communications SupraPlaus HW261N headsets and appreciated its clarity and comfort level and increased their productivity in their professional life. SupraPlus wideband which is the Plantronics series high quality headsets. Plantronics HW261N comes in binaural and monual both the types of headsets. Plantronics HW261N is noise canceling headsets which is famous for its day to day comfort level and reliability. Plantronics SupraPlus HW261N reduce the noise in noisey envoirnment and prodcued greater productivity from the agents. Plantronics HW261N SupraPlus is the replacement of the discontinued model of plantronics H261N. SupraPlus is fully compatible with standard band environments which provides more natural sound and clear conversations. SupraPlus HW261N has Ultra noise canceling microphone which reduce backround noise for professional level sound clarity. Its Over-the-head binural design provide all day comforatable for intesive use. 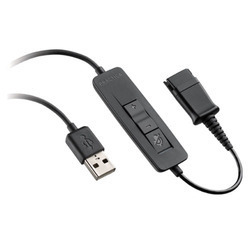 Compatible with all USB-to headsets adapters with a QD connection and supports all Plantronics amplifiers. It comes with Quick Disconnect cord so that agents can move from their desk and phone without removing headsets. 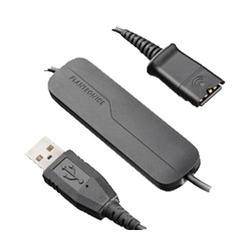 Expand the connectivity options of your current Plantronics H-Series headsets with the DA40 USB adapter. With this corded USB-to-headset adapter and H-Series headset (traditionally used with a desk phone) you can now manage PC communications with superior call clarity. Bring exceptional audio quality to contact center conversations with the Plantronics SP-USB20 USB audio processor. The USB audio processor delivers audio connectivity for SP11-QD and SP12-QD headsets with PC-based softphones via the USB port. Ergonomically designed inline controls provide volume, mute on/off (with LED indicator). Great for contact center applications and, paired with a noise-canceling SP11-QD or SP12-QD headset, enables softphone users to conduct clear and natural customer interactions. The Quick Disconnect(TM) feature between audio processor and headset allows you move away from your phone without removing your headset or disconnecting the call. The Quick Disconnect(TM) feature between audio processor and headset allows you move away from your phone without removing your headset or disconnecting the call. Bring exceptional audio quality to contact center conversations with the Plantronics SP-USB20 USB audio processor. The USB audio processor delivers audio connectivity for SP11-QD and SP12-QD headsets with PC-based softphones via the USB port. Ergonomically designed inline controls provide volume, mute on/off (with LED indicator). Great for contact center applications and, paired with a noise-canceling SP11-QD or SP12-QD headset, enables softphone users to conduct clear and natural customer interactions. The Quick Disconnect™ feature between audio processor and headset allows you move away from your phone without removing your headset or disconnecting the call. Enter UC with the best-featured headset you never thought your budget could buy. The Blackwire 320 USB headsets deliver simplicity, durability, comfort, and professional sound at an entry-level cost. Meet the Blackwire 320 corded USB headsets designed for companies just starting out with Unified Communications. The headsets easily and intuitively juggles PC calls and multi-media using audio alerts to manage connection, mute and volume status. Easy to use, the Blackwire 320 offers premiumhi-fi stereo audio (C320) and all-day comfort. Avaya headsets have 5 options for Quick Connect Cables with various end connections for different connectivity options. Avaya’s Quick Connect connectors are based on magnetic pogo pins. The Accessory Cables have Quick Connect starting with a Male Connect to the different connectivity options to Hook-Switch (RJ9), USB Type A or 3.5mm connectors. One additional option is for a supervisor-trainee cable designed for new agents in Call Centers, where the Quick Connect splits into 2 male connectors for the trainee, and the supervisor. The L129, L139, L149 Cables are 2.5mm in diameter, and start with a Quick Connect Female Connector. start with a Quick Connect Female Connector.